The 2011 Prince of Asturias Awards Laureates will begin to arrive in Asturias from 17th October onwards to take part in the Awards Ceremony to be held at the Campoamor Theatre in Oviedo on 21st October. The neurobiologists conferred with the Prince of Asturias Award for Technical and Scientific Research will be the first to arrive. 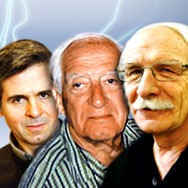 - The scientist Joseph Altman, bestowed with the Prince of Asturias Award for Technical and Scientific Research, will get to the Hotel de la Reconquista at 12:30 p.m.
- Giacomo Rizzolatti will arrive around 5:45 p.m.
- The Mexican scientist Arturo Álvarez-Buylla will arrive sometime throughout the day. - Howard Gardner, bestowed with the 2011 Prince of Asturias Award for Social Sciences, will get to Oviedo around 12:30 p.m.
- Maestro Riccardo Muti, Prince of Asturias Award for the Arts, will be in Oviedo around 5:45 p.m.
- The delegation of the Heroes of Fukushima that will come to Oviedo to collect the Prince of Asturias Award for Concord will get to the Hotel de la Reconquista at 7:55 p.m.
- Leonard Cohen, Prince of Asturias Award for Literature, will arrive in Oviedo around 10:20 p.m.
- Dr Sir Paul Nurse, President of The Royal Society, the organisation bestowed with the Prince of Asturias Award for Communication and Humanities, and its Executive Director, Julie Maxton, will get to Oviedo in the afternoon. - Bill Drayton, bestowed with the Prince of Asturias Award for International Cooperation, will arrive at the Hotel de la Reconquista around 10:40 a.m.
- The Ethiopian athlete Haile Gebrselassie, Prince of Asturias Award for Sports, will get to the Hotel de la Reconquista around 12:30 p.m. The schedule of arrivals at the Reconquista Hotel is approximate and subject to change.